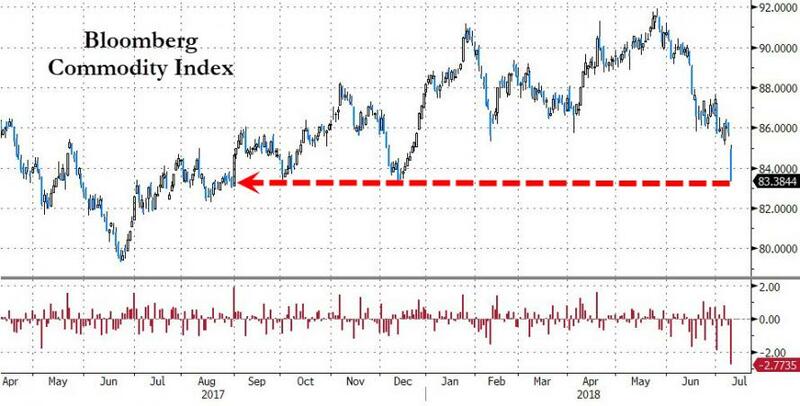 Despite a massive crude inventory draw, that initially sent WTI higher, it appears the weight of anxiety over global demand - stoked by an escalating trade war - further augmented by a soaring dollar, has sparked an avalanche of selling in the energy complex. 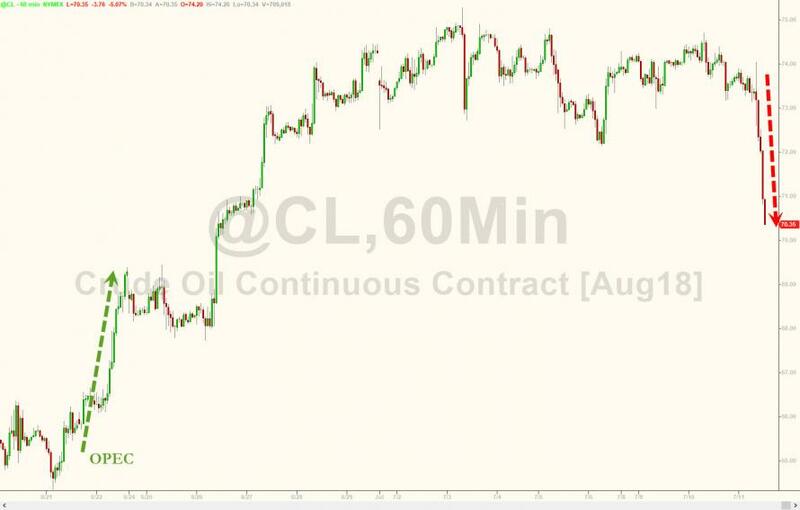 Oil has settled a whopping $5.46 lower, or over 7% down on the day, which is oil's biggest drop since Feb 2016. 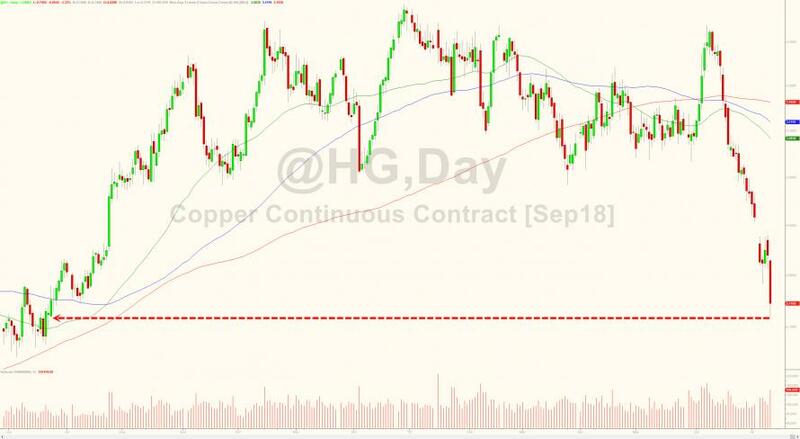 But it's not just oil: the entire metals space is getting hammered on fears of a Chinese - and global - economic slowdown, with copper prices plunging as much as 4% in London, the biggest drop since December 2017; futures have lost almost 17% since peaking in early June. 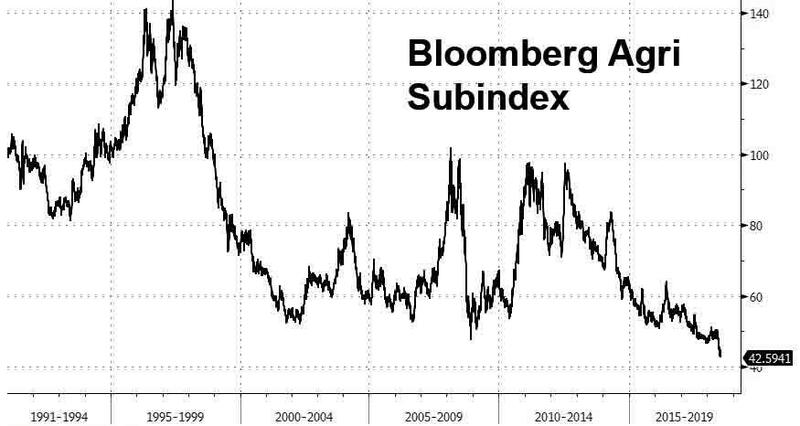 Ironically, as commodities plunge, the prices of a whole slew of consumer products - those made in China - are about to surge as a result of the upcoming tariffs. How the US economy responds to this bifurcated price response, with deflation hitting commodities on fears of an economic slowdown alongside more highs in the dollar coupled with inflation for staples and other consumer products, may determine just how much longer the Fed can go on pretending it will hike rates another 7 or 8 times before it has to stop, start easing, and perhaps even do more QE.